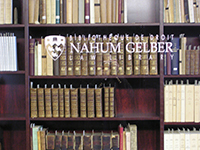 Nahum Gelber Law Library is now subscribed on the Annotated Leading Cases of International Criminal Tribunals database. It provides you with the full text of the most important decisions, including concurring, separate and dissenting opinions. Distinguished experts in the field of international criminal law have commented the most important decisions of the ICTY, ICTR, The Special Court for Sierra Leone, The International Criminal Tribunal for Timor-Leste and the ICC. Annotated Leading Cases of International Criminal Tribunals is useful for students, scholars, legal practitioners, judges, prosecutors and defence counsel who are interested in the various legal aspects of the law of the ICTY, ICTR and other forms of international criminal adjudication. During the holiday break, we migrated our subject guide to a new tabbed layout. We hope that this design that uses tabs instead of subheadings to divide the subsections will be more conducive to the resource discovery. It allows to avoid vertical scrolling and provides more visibility for the resources that were previously “buried” at the bottoms of the pages.